The meanings of the symbols on the dollar bill-Truth! - Truth or Fiction? The meanings of the symbols on the dollar bill-Truth! The Meanings of the Symbols On the One Dollar Bill-Truth! This email asks you to look at the one dollar bill and explains the various symbols and their meanings. TruthOrFiction.com has received numerous requests to verify whether the representations in the email are accurate. Although symbols are open to many interpretations, we do have some historical insight into the design and meaning of some of the images on the one dollar bill. Using the text from the most commonly circulated email on this subject, let’s go through some of the lines that seem to be of most interest. All explanations and interpretations are taken from the United States Treasury Department and the United States Department of State, which is the official keeper of the United States Seal. eRumor: The one dollar bill you’re looking at first came off the presses in 1957 in its present design. This is true. According to the U.S. Treasury Department, that is when the motto, “In God We Trust” started being used on paper money. It was in use on coins long before that. eRumor: If you look on the front of the bill, you will see the United States Treasury Seal. On the top you will see the scales for the balance-a balanced budget. That may be somebody’s interpretation of the scales, but the Treasury Department has little to do with whether the budget is balanced. That’s handled by congress. According to the U.S. Treasury Department, the balancing scales represent justice. eRumor: In the center you have a carpenter’s T-square, a tool used for an even cut. It is not a carpenter’s T-square. It is a chevron with 13 stars representing the 13 original colonies. eRumor: Underneath is the Key to the United States Treasury. It is not the key to the United States Treasury. It is using the key as a symbol of authority. eRumor: That’s all pretty easy to figure out, but what is on the back of that dollar bill is something we should all know. If you turn the bill over, you will see two circles. Both circles, together, comprise the Great Seal of the United States. This is true. The back of the dollar bill has become so familiar to Americans, that many may not have realized two things. One is that the symbols are from the official Great Seal of the United States. The other is that the Great Seal actually has two sides. eRumor: The First Continental Congress requested that Benjamin Franklin and a group of men come up with a Seal. Before the adjournment of the Continental Congress on July 4th, 1776, a committee was appointed to develop a seal for the United States. The committee was Benjamin Franklin, John Adams, and Thomas Jefferson, three of the five men who had drafted the Declaration of Independence. They were merely the first committee, however. It took six years, the work of two additional committees and a total of 14 men before a final version of the Great Seal was approved. The final proposal, which was accepted by Congress, was submitted on June 13, 1782 by Charles Thompson who had the title Secretary of Congress. He brought together some of the recommendations of the three committees, their consultants, and artists. eRumor: If you look at the left hand circle, you will see a Pyramid. Notice the face is lighted and the western side is dark. This country was just beginning. We had not begun to explore the West or decided what we could do for Western Civilization. First, the pyramid was not a part of the proposals for the Great Seal until the third committee. It was not suggested by Jefferson, Franklin, and Adams. As to the lighting on the East or West of the pyramid, we did not find any such official explanation. eRumor: The Pyramid is UN-capped, again signifying that we were not even close to being finished. eRumor: Inside the capstone you have the all-seeing eye, and ancient symbol for divinity. It was Franklin’s belief that one man couldn’t do it alone, but a group of men, with the help of God, could do anything. eRumor: At the base of the pyramid is the Roman Numeral for 1776.
eRumor: If you look at the right-hand circle, and check it carefully, you will learn that it is on every National Cemetery in the United States. It is also on the Parade of Flags Walkway at the Bushnell, Florida National Cemetery and is the centerpiece of most hero’s monuments. Slightly modified, it is the seal of the President of the United States and it is always visible whenever he speaks. The Presidential Seal has the eagle facing to the eagle’s left toward the olive branch instead of toward the eagle’s right as on the Original Great Seal. This represents that the U.S. as a country of peace but one who is ready to defend itself. The seal on the dollar bill has always appeared in this manner according to a February 22, 2008 Washington Post article. The original Presidential Seal displayed the eagle facing right toward the talon with the 13 arrows, which can still be seen on the Resolute Desk in the White House. A change to the official Presidential seal was ordered by President Harry Truman in 1945. 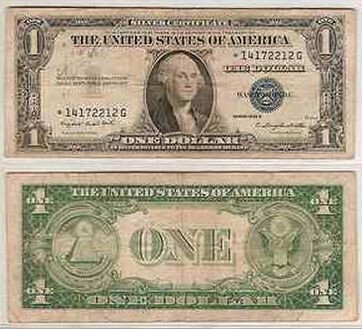 Images left: is the front and back side of a 1935 US Dollar Bill. Right: is the seal on the Resolute Desk. eRumor: yet no one knows what the symbols mean. The Bald Eagle was selected as a symbol for victory for two reasons: first, he is not afraid of a storm; he is strong and he is smart enough to soar above it. Secondly, he wears no material crown. We had just broken from the King of England. We could not find this particular explanation of the imagery of the eagle in the official records. Most references to the eagle indicate that it represents something of uniquely American origin. One of the original design proposals for the Great Seal featured a small crested white eagle, which is not uniquely American. eRumor: Also, notice the shield is unsupported. This country can now stand on its own. This is accurate. Charles Thompson said it denoted that the United State of America ought to rely on their own virtue. Actually, the shield consists of red and white stripes with a blue bar above and which does represent Congress. The colors are taken from the American flag and officially, the red represents hardiness and valor, the white represents purity and innocence, and the blue, vigilance, perseverance, and justice. eRumor: Above the Eagle you have thirteen stars representing the thirteen original colonies, and any clouds of misunderstanding rolling away. eRumor: Notice what the Eagle holds in his talons. He holds an olive branch and arrows. This country wants peace, but we will never be afraid to fight to preserve peace. The Eagle always wants to face the olive branch, but in time of war, his gaze turns toward the arrows. 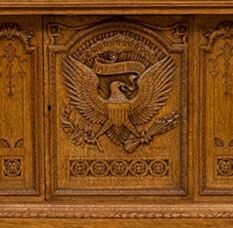 The official meaning is that the olive branch and the arrows “denote the power of peace & war.” As noted above, the design has been with the eagle facing the arrows except for when President Harry Truman turned the face toward the olive branch on the Presidential Seal. eRumor: They say that the number 13 is an unlucky number. This is almost a worldwide belief. You will usually never see a room numbered 13, or any hotels or motels with a 13th floor But, think about this: 13 original colonies, 13 signers of the Declaration of Independence, 13 stripes on our flag, 13 steps on the Pyramid, 13 letters in the Latin above, 13 letters in “E Pluribus Unum”, 13 stars above the Eagle, 13 plumes of feathers on each span of the Eagle’s wing, 13 bars on that shield, 13 leaves on the olive branch, 13 fruits, and if you look closely, 13 arrows. And for minorities: the 13th Amendment. The significance of the number 13 in all the symbolism represents the beginning of the country, the 13 colonies. Take out a dollar bill and look at it. If you look on the front of the bill, you will see the United States Treasury Seal. On the top you will see the scales for the balance-a balanced budget. In the center you have a carpenter’s T-square, a tool used for an even cut. Underneath is the Key to the United States Treasury. That’s all pretty easy to figure out, but what is on the back of that dollar bill is something we should all know. If you turn the bill over, you will see two circles. Both circles, together, comprise the Great Seal of the United States. The First Continental Congress requested that Benjamin Franklin and a group of men come up with a Seal. It took them four years to accomplish this task and another two years to get it approved. If you look at the left hand circle, you will see a Pyramid. Notice the face is lighted and the western side is dark. This country was just beginning. We had not begun to explore the West or decided what we could do for Western Civilization. The Pyramid is UN-capped, again signifying that we were not even close to being finished. Inside the capstone you have the all-seeing eye, and ancient symbol for divinity. It was Franklin’s belief that one man couldn’t do it alone, but a group of men, with the help of God, could do anything. Above the Eagle you have thirteen stars representing the thirteen original colonies, and any clouds of misunderstanding rolling away. Again, we were coming together as one. Notice what the Eagle holds in his talons. He holds an olive branch and arrows. This country wants peace, but we will never be afraid to fight to preserve peace. The Eagle always wants to face the olive branch, but in time of war, his gaze turns toward the arrows. They say that the number 13 is an unlucky number. This is almost a worldwide belief. You will usually never see a room numbered 13, or any hotels or motels with a 13th floor But, think about this: 13 original colonies, 13 signers of the Declaration of Independence, 13 stripes on our flag, 13 steps on the Pyramid, 13 letters in the Latin above, 13 letters in “E Pluribus Unum”, 13 stars above the Eagle, 13 plumes of feathers on each span of the Eagle’s wing, 13 bars on that shield, 13 leaves on the olive branch, 13 fruits, and if you look closely, 13 arrows. And for minorities: the 13th Amendment. I always ask people, “Why don’t you know this?” Your children don’t know this and their history teachers don’t know this. Too may veterans have given up too much to ever let the meaning fade. Many veterans remember coming home to an America that didn’t care. Too many veterans never came home at all. Tell everyone what is on the back of the one dollar bill and what it stands for, because nobody else will. Police photographer captures picture of an angel-Unproven! The Cross in the Flag-Truth!